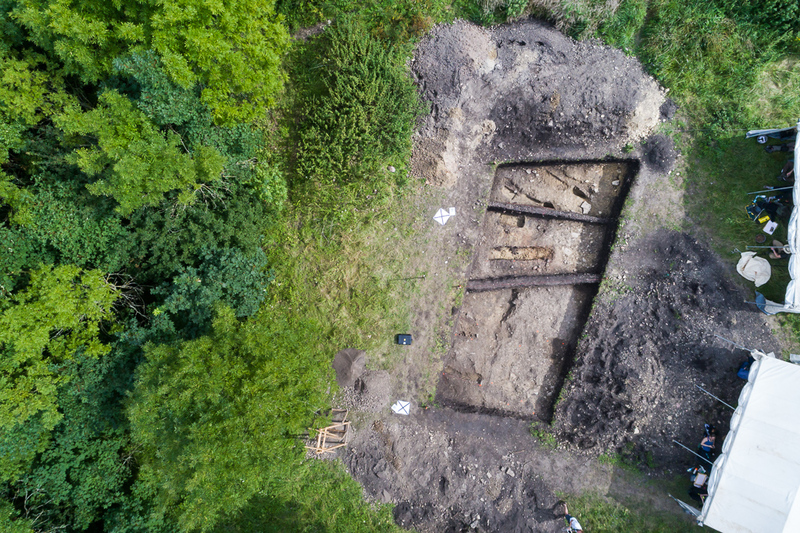 The first flight campaign for the Institute of Prehistoric and Protohistoric Archaeology of the Friedrich-Schiller-University Jena started this August 2017. Location is the region of the small hill “Alter Gleisberg” in Thuringia. 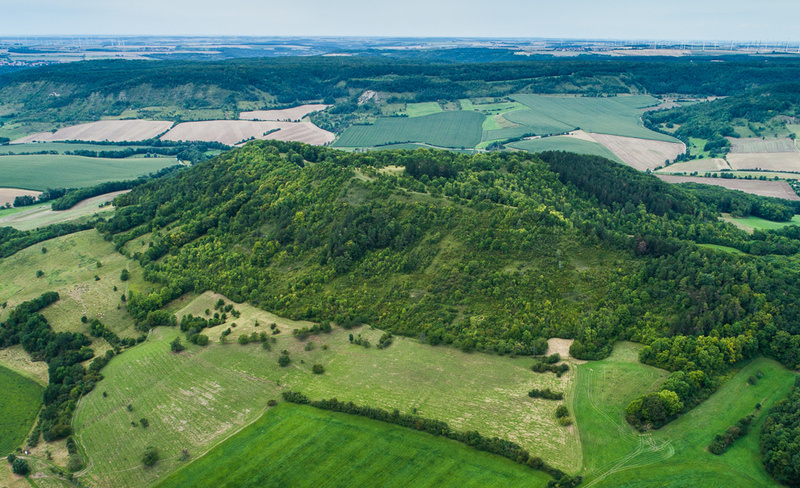 The plateau has a size of 500x250m (6.9ha) and levels at a height of 200 m. It is known for the prehistoric settlement going back to the Neolithicum and the Early Bronze age. 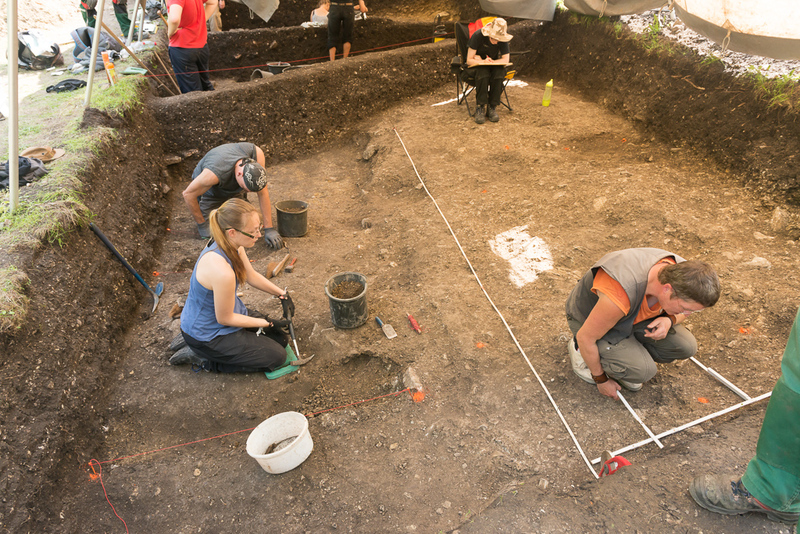 The Friedrich-Schiller-University is active yearly with archaeological excavation projects to understand intensity and development of these settlements and to study also the settlement impact on the landscape. More information about this project is available on the project page of the Institute of Prehistoric and Protohistoric Archaeology. Fig. 1 – The region of the “Alter Gleisberg” – a copter shot facing NE. 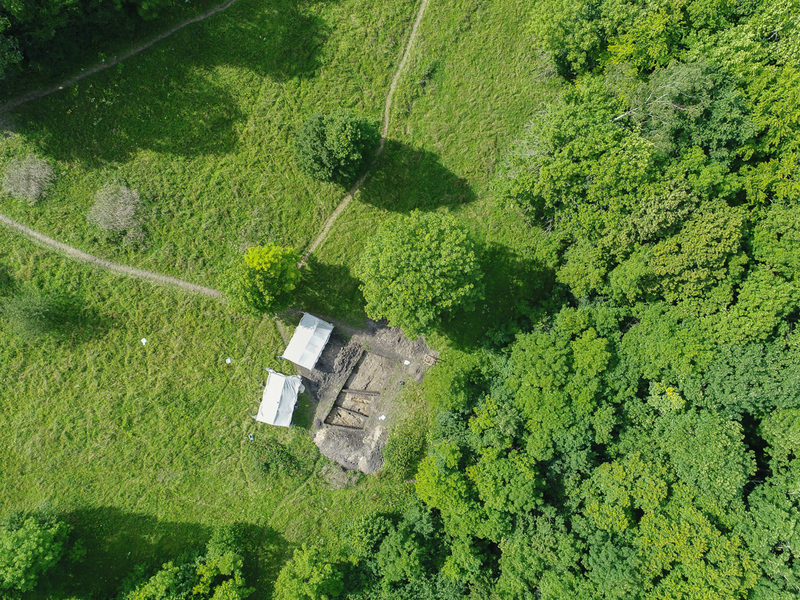 In August 2017 three different Phantom 4 Pro flights with varying altitudes were done using DroneDeploy flight planning and manual control (very high resolution data mapping of the archeological excavation site). 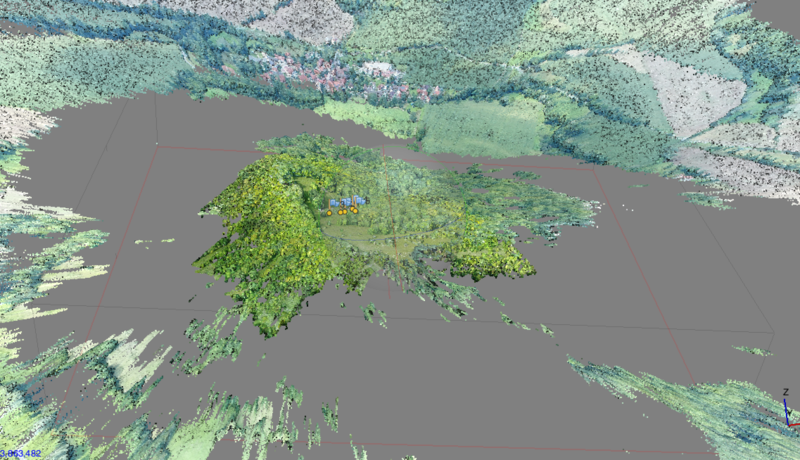 The copter data coverage and mapping creates 3D point cloud models in different scales, ortho image mosaics (RGB), a digital surface model of the full Gleisberg region and in combination with a winter flight campagn a digital terrain model is planned. 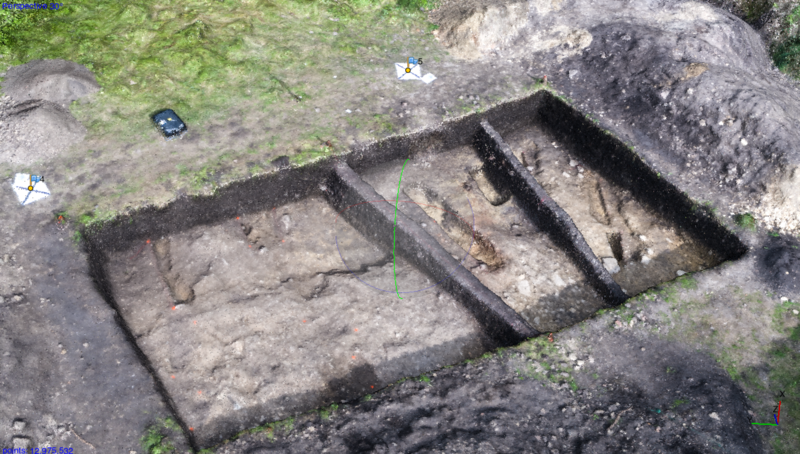 Annual mapping of the excavation activities will lead to a full database of all surface mass movements for the next 5 years. For precise geo referencing a GNSS Stonex S3 DGPS system is used with 5 reference points in different terrain heights. 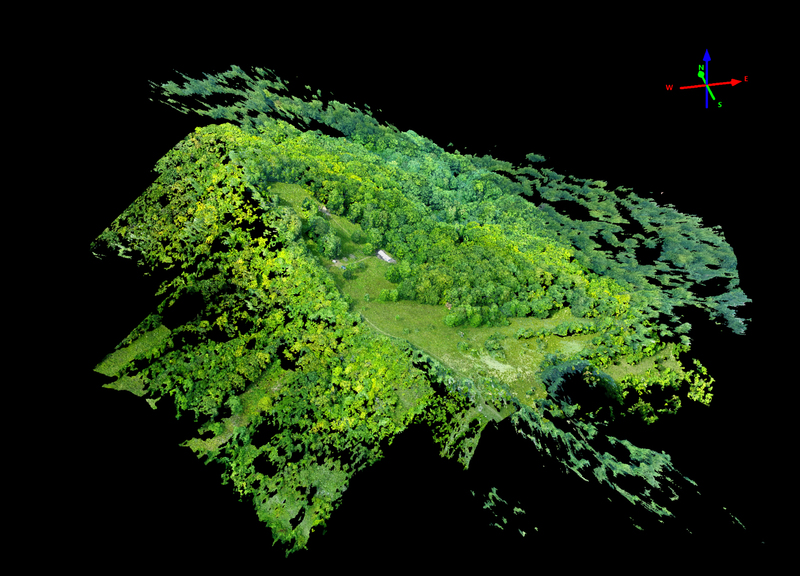 Measurement is done in order to increase the alignment accuracy of the image database and to improve the absolute georeferencing accuracy of the resulting image datasets. Overall approx. 500 images were captured in DNG Raw image file format – each with 20 Megapixel resolution and GPS tagged from the Phantom 4 Pro copter. 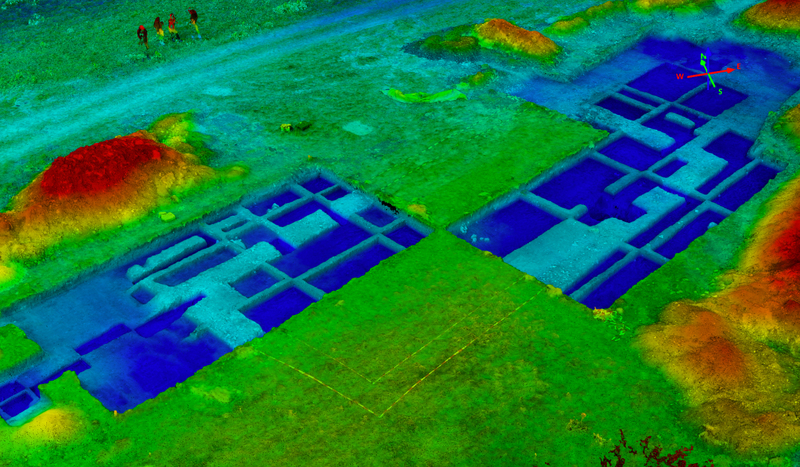 Data processing, DGPS reference point integration and point cloud calculation with full workflow to georferenced surface model and ortho image mosaic is done with Agisoft Photoscan Software. Fig. 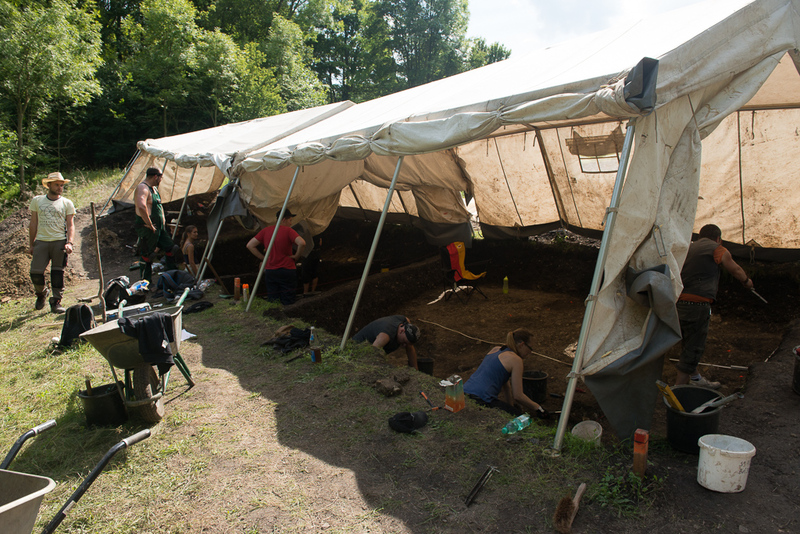 2 & 3: The archaeological excavation site (before removing the tent for the flight campaign). Fig. 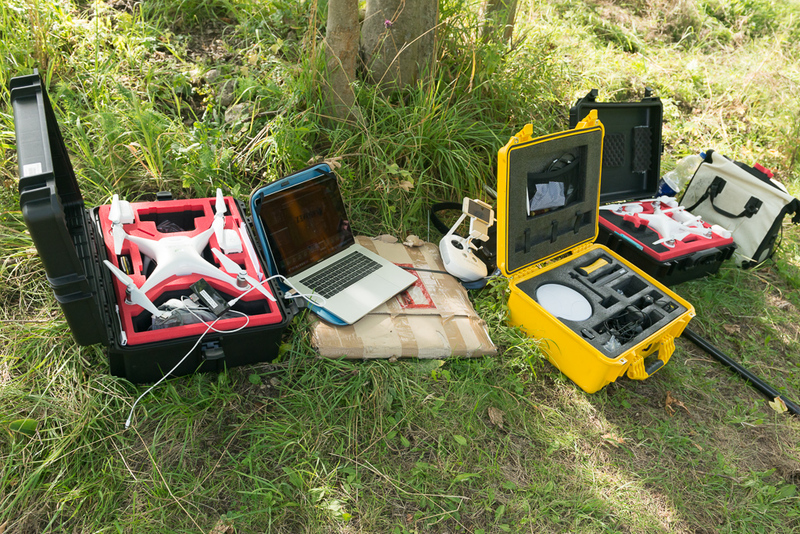 4: DJI Phantom 4 Pro and the Stonex S3 receiver in Pelicase box systems (background: Phantom 3 Advance). Fig. 5: Fine scale flight campaign in 10m flight altitude. Example image in DNG RAW 20 Megapixel resolution. Fig. 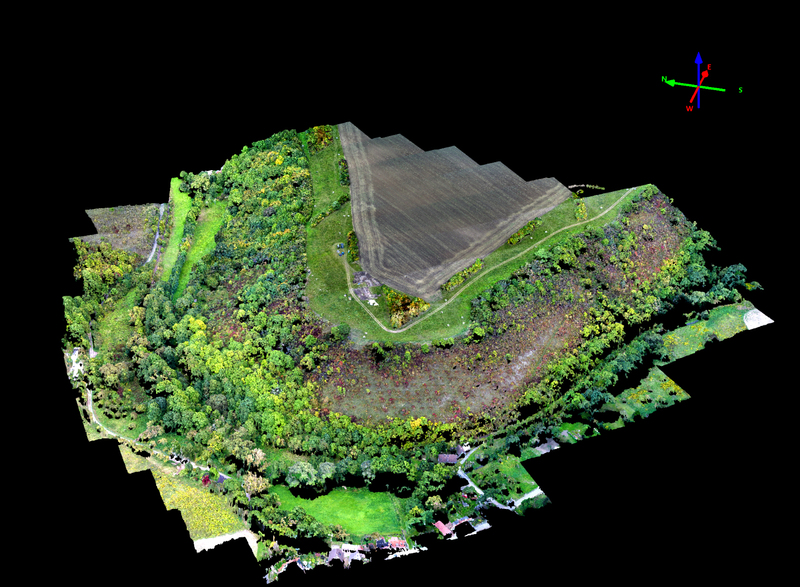 6 Example shot – medium resolution flight altitude. 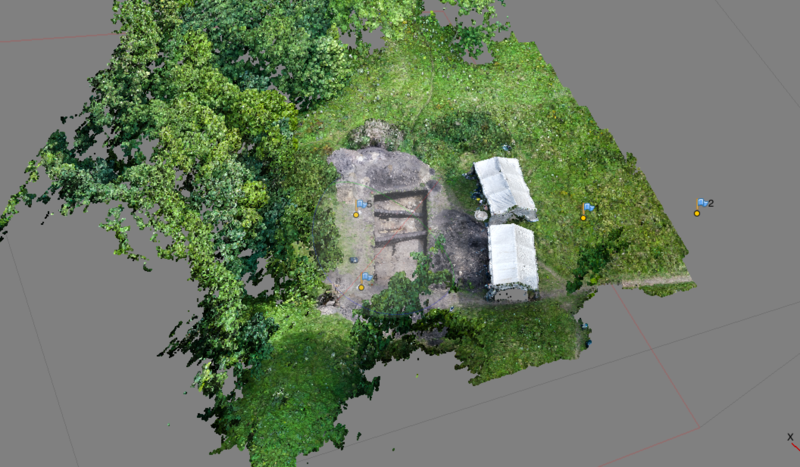 First results of the 2017 mapping campaign processed to medium resolution point clouds (not using the full 20 Megapixel spatial resolution within the dense point cloud calculation step) shows accurate delineation of the archaeological dig. Fig. 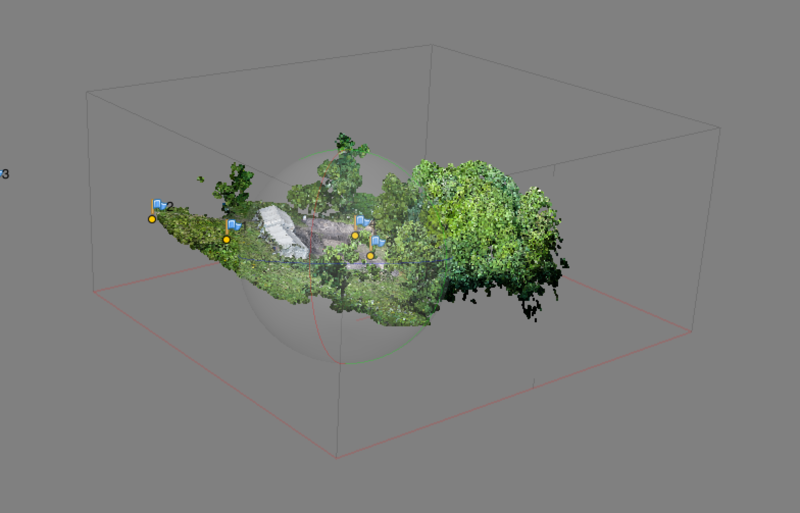 7-9: Detailed 3D Dense Point Cloud of the archaeological excavation site. 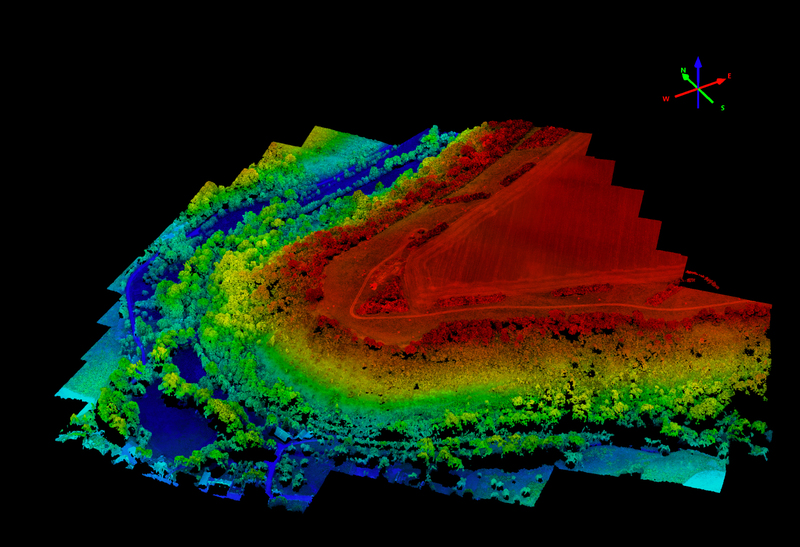 Detailed mapping scale from 10 m flight altitude. 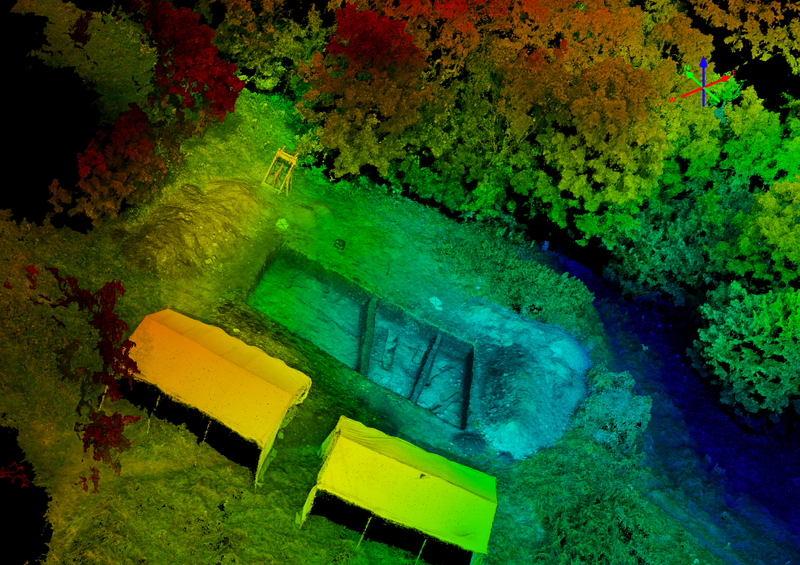 Die unterschiedlichen Datensätze der Befliegungen für die Grabungen auf dem Alten Gleisberg und bei Kuckenburg in 2017 sind nun vollständig an das Seminar für Ur- und Frühgeschichtliche Archäologie übergeben worden. Die abgeleiteten Datenlayer umfassen jeweils Punktwolkenmodelle im LAS Format, DSM (Digitales Oberflächenmodell ohne Normalisierung) und jeweils das Orthomosaik mit Georeferenzierung von der Befliegung. Alle Daten wurden nach UTM32 WGS84 georeferenziert. Insgesamt wurden Daten im Umfang von über 100 GB verarbeitet. Die Befliegungen fanden jeweils in drei verschiedenen Flughöhen statt und liefern nun nach der Berechnung der Punktwolke eine cm-genaue Darstellung der Grabungsflächen bzw. deren 3D-Volumenwerte. 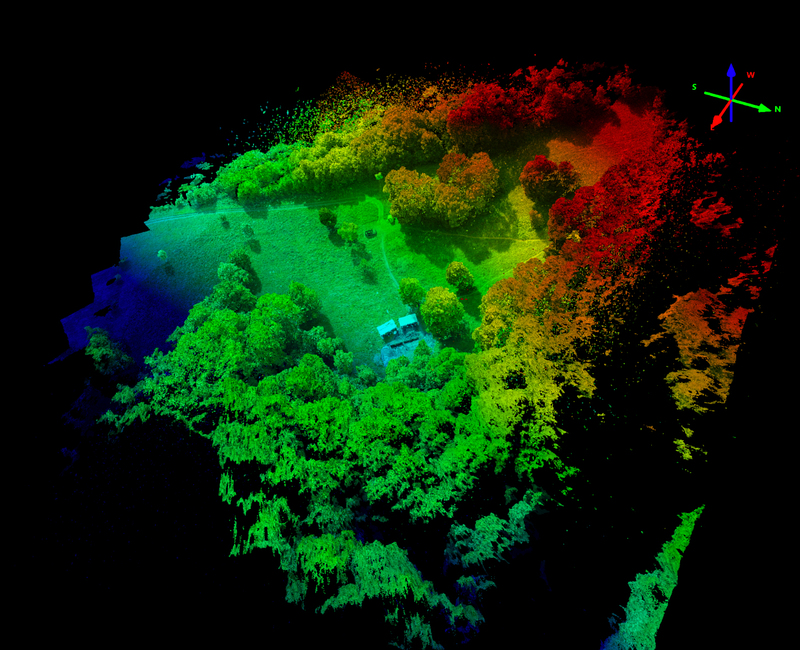 Die präzise Verarbeitung und Georeferenzierung der Copter Daten von diesen Befliegungen ist durchaus aufwändig. Jedoch methodisch eher unproblematisch schritt. Schwieriger wird die präzise Punktwolkenfusion aus verschiedenen Grabungen werden. Hier ist die absolute Georeferenzierungsgenauigkeit entscheidend. Abb. 1: Grabungsareal der Kuckenburg-Befliegung vom September 2017 (Tiefbefliegung mit der Phantom 4 Pro, Punktdatenmodell mit 70 Mio Punkten abgeleitet aus einem Bilddatenpool von 250 Fotos). Abb. 2: Grabungsareal der Kuckenburg-Befliegung – Hochbefliegung. Abb. 3. Befliegung am alten Gleisberg – in dieser Abbildung: das Punktmodell der Hochbefliegung vom August 2017. Abb. 4. Befliegung am Alten Gleisberg – Detailbefliegung des Grabungsareals.